There are a lot of fans who believe the Ottawa Senators were born in 1992 thanks to Bruce Firestone's money, Mel Bridgman's coke bottle glasses and Alexei Yashin's and later Alexander Daigle's failed promise. But in actuality the Ottawa Senators pre-date the National Hockey League, the Montreal Canadiens, and even the 20th century. The original Ottawa Senators date all the way back to 1883! Okay, so the the original Senators and today's franchise have no direct relation. They just happen to share the same name. But ever since the rebirth of major league hockey in Canada's national capital there has been some degree of curiosity about the original Sens. They were an amateur-turned-professional squad also known as the Ottawa Hockey Club and the Silver Seven. Blessed with multiple Stanley Cup championships, it was a time where hockey interest in the Canadian capital was perhaps even stronger than nowadays. Heroes like Frank Jenkins, P.D. Ross, Frank McGee, Jack Darragh, Alec Connell, Cy Denneny, and Punch Broadbent, amongst so many others, brought civic and hockey pride. But there has not been a lot of great, indepth information compiled on this lost era of hockey. There has only been one noteworthy book on the old Sens: Old Scores, New Goals: The Story of the Ottawa Senators, by Joan Finnigan, the daughter of Ottawa hockey great Frank Finnigan. Well now there's another book to delve into. 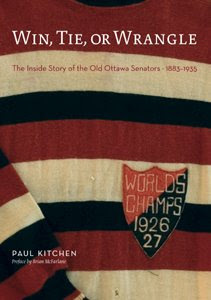 Win, Tie, Or Wrangle: The Inside Story of the Old Ottawa Senators 1883-1935 is a new offering from Penumbra Press. It is written by Paul Kitchen, and that means the text is guaranteed to be the most thoroughly researched book on the Ottawa hockey of that time frame. Research is Kitchen's game. He is a retired librarian and executive director of the Canadian Library Association. He spent seven years exhausting the archives of the Ottawa Public Library, City of Ottawa Archives, Bytown Museum of Ottawa and other Ottawa-based resources. It is a good thing he is a professional researcher, as anyone familiar with Ottawa will know the city's archives and museums would take most of decades to dig through. Kitchen is also extremely well connected, as he is a past president of the Society for International Hockey Research, the association of all of hockey's historians. In fact he has SIHR's most famous member, Brian McFarlane, write the preface. I guess Canadian Prime Minister, another member, was too preoccupied with things other than hockey in Ottawa these days. Without doubt there could be no more qualified person to unearth the Senators largely unknown origins. The Ottawa Sun probably sums up Kitchen's resume best when it describes the book as "an impressively detailed history." "Paul Kitchen...takes us back to an era that has always piqued the curiosity of hockey fans: an era when competing teams changed ends after every goal; when an early day outdoor rink on the river might stretch for 400 feet; when (a player) might be forced to stickhandle around an ice statue located in the middle of the rink." My worries were all for not. Kitchen proves to be a gifted writer, expertly taking us back in time with description so certain we are completely reassured and comfortable in his undeniable authority. It is almost as if he travelled in a time machine, that is how well he understands the time period and the goings on. He captures the reader early and keeps that momentum going to the end. This book is so much more than a book about hockey heroes and game accounts. It is also in many ways a time-period history of society in Ottawa, and even in Canada. This book is probably the best kept secret of the 2008 hockey book season. It is a late entry into the market, without much publicity or a national audience. In fact I only found out about the book in late November. But when I got my review copy I could not put it down. It is a fascinating, incredibly researched, and well written history of not just hockey in Ottawa, but hockey's origins and Canadian history in general.